Raise your hand if you feel like you're always cleaning your house! Don't worry, you're not alone but I bet you're like us and always forget to clean your sink. Did you know studies show that it's usually the dirtiest place in your home? Yikes! Today we're sharing some tips on how to keep your sink sparkling clean and most importantly, bacteria free. 1. Clear any dishes, old sponges or trash. Move any unused soap dispensers (bonus, grab some soap from the Dollar Store and refill them!) or anything else on or around your sink. 2. Using this tutorial from Morgan Manages Mommyhood, clean out the disposal. The hot water removes build-up, grease and more! 3. 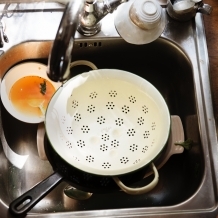 Soak a cloth in vinegar and sprinkle baking soda all over your sink. Use the cloth to scrub the sink, rinse with hot water. 4. Organize the bottles and things under your sink with these great tips! 5. To keep things clean in between, make a batch of these easy (& adorable) garbage disposable tablets from Bits n Giggles blog! A clean home is a happy home (or at least a start! ).